Are you considering an MRI for your practice? Is MRI an affordable technology? Has the complexity of the technology kept you from moving ahead? Are you concerned about your return on investment or which machine is the right one? 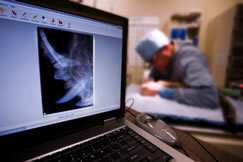 Don’t be fooled by used human scanners with false claims or new generic vet companies trying to sell old techologies. There is only one MRI scanner built exclusively for animals with veterinary protocols and dedicated software, tuned specifically for animal imaging… The Esaote Vet-MR.
Now Universal Medical Systems, the exclusive US distributor for the Vet-MR product line, if offering a rental program that will address these concerns. Browse this site and learn how MRI imaging will benefit your practice and your patients as well as your bottom line.